Drazen Kozjan on The Pit and the Pendulum (1961) | Who Killed Orrin Grey? The Pit and the Pendulum (1961), the second in in Roger Corman’s series of Edgar Allan Poe adaptions following the success of The Fall of the House of Usher, holds a special place in my heart for a number of reasons. Like the stories of Poe, which were the doorway to lifelong enthusiasm for macabre literature, watching this film on television as a youngster in the seventies was one of the first horror cinema experiences that impacted me. The films title and startling end set piece of a human being tied down in a bleary, blue drenched dungeon while a massive hatcheted pendulum swung inexorably down upon him impressed itself on my brain, ushering countless hours of horror movie viewing and a life long appreciation of Vincent Price, the mentally shattered, maniacal, wielder of this towering instrument of death and star of this movie. The film also introduced me to one of my favourite “scream queens”, Barbara Steele, whose majority of movies I wouldn’t see till years later, and writer Richard Matheson (I Am Legend, The Incredible Shrinking Man and Twilight Zone episodes) as well as director Roger Corman. All to become future staples of a horror diet. 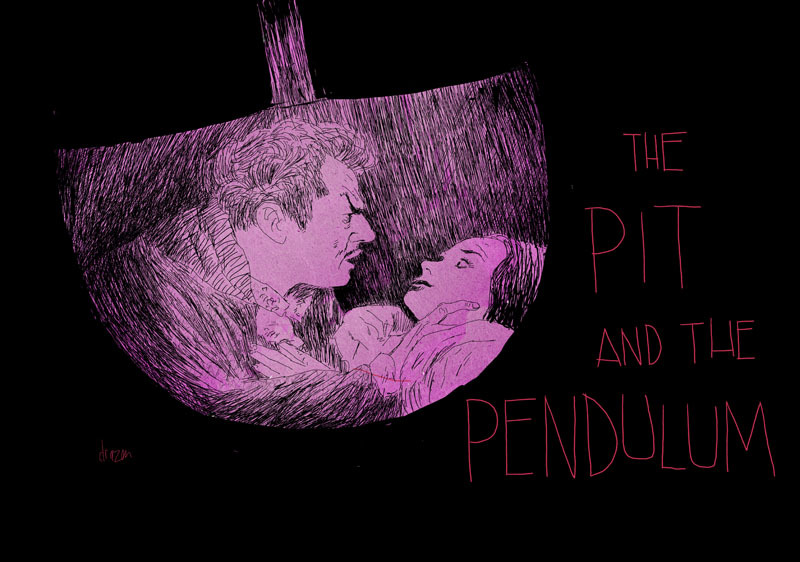 I re-watched The Pit and the Pendulum and by no means a writer of reviews, I did my best to briefly convey my thoughts on why the movie jarred me then and why it impresses me still. I guess there are spoilers if you haven’t seen it, if such things matter to you . Poe’s terror stories never went beyond the short form, believing them the best vehicle for his theory of “unity of effect”. A reader, in a single reading, would be enveloped in a relentless mood of dread, despair, decay, and an escalating horror in the fevered mind and words of the narrator of of one of his tales. Expanding one of Poe’s nightmare jewels into feature script is already a difficult (and probably losing) proposition but director Roger Corman and screenwriter Richard Matheson do an admirable job that does justice to his bleak vision and tortured internal landscapes and creates a portrait of obsession and decay that I find hypnotic. Opening with a suitably sixties psychedelic liquid gel title sequence and haunting, almost abstract music by Les Baxter, the movie already gives a hint that we are on shaky mental ground and headed for a colour soaked mind trip. A brief carriage ride by Francis Barnard (John Kerr) and a walk through a nondescript, eerily dreamy forest up to the door of the looming, gothic castle of Nicholas Medina (Vincent Price) on the edge of ceaselessly turbulent sea are the only signs of the outside world that we will see during the course of the film . By setting the story entirely within the confines of the castle, Corman makes a great decision. The castle, its memories and ghosts, shadows and corridors, opulent furnishings and netherworldly dungeons become a reflection of Price’s anguished mind and the tumultuous relationships, past and present, of the story. he is being led to her tomb when the castle erupts in monstrous groanings and creaks from somewhere behind the stone walls and heavy doors. Investigating, Francis is greeted by an obviously high-strung Price, whose startled face leaps from behind a door anticipating Francis’ entry. I love Price’s delivery of a line here as he explains away the mysterious sounds as “It’s an apparatus that must be kept in constant repair.” … what kind of apparatus makes noises like these, we wonder. From his first appearance Price’s performance is a spectacular one. Moving effortlessly between romantic reminiscence of his dead wife to frayed nerve despair, he plays the character to the hilt but never so much that the tragedy of his character is not evident or taking one out of the story (at least not me). Elizabeth Medina (Barbara Steele) first appears in blue tinted flashbacks over Price’s narration, relating the story of the initial joy of their union to the gradual disintegration of Elizabeth as she becomes tortured by the oppressive history of the castle and the memory of Price’s father, a infamous inquisitor who tortured innumerable people in the castle dungeon. She eventually becomes sickly, not eating and dies after a illness succumbing to the horrors of her mind. Elizabeth’s brother, skeptical, is told Price’s story in a flashback by his sister attempting to justify his questionable behaviour. She tells of how Nicolas as a boy, was witness to the murder of his mother and his Uncle by his father Sebastian (also Price) in the dungeon after confronting them with their adultery. After pummelling the uncle with a hot poker, Price tortures his wife and puts her in a iron maiden. Thus Price is consumed with guilt, he watched the death of his mother, as well as being helpless to stop the death of his own wife. Price’s friend, Doctor Leone (Antony Carbone) who has arrived and stays to comfort Nicolas, attempts to alleviate the brother’s suspicions but to no avail. The brother continues to be skeptical as the memory of Elizabeth seems to take on supernatural, material existence , her voice is heard through the castle, her room upheaved and her painting torn, all bringing Price closer and closer to collapse, fearing Elizabeth is coming to avenge her death on him, as we then learn, because she has been possibly buried alive. Upon opening her crypt, this in fact appears to be the case. Price is terrific through all this, at first denying he has anything to do with Elizabeth’s apparent haunting, as Francis accuses him, to then wondering if he is in fact doing this destruction and is so far gone he doesn’t realize it. Price’s exuberant performance is wonderfully enhanced by Roger Corman’s direction, Floyd Crosby’s cinematography, and Daniel Haller’s art direction. Corman composes beautiful Panavision shots, drenched in colour or submerged in shadows. There is a feeling of hugeness, vast rooms and endless hallways juxtaposed by a claustrophobia within that same space, like it’s all closing in no matter how big the castle,or luxurious the furnishings, and mirroring the character’s psychic upheaval and decline. All the while outside the storm rages and builds. My favourite section of the movie is the resurrection of Elizabeth. A real tour de force. The camera follows the haunted Price as he is pulled by Elizabeth’s ethereal call of his name, he moves anguished, through cobwebbed , mazelike corridors , her voice eventually leading him to her tomb. 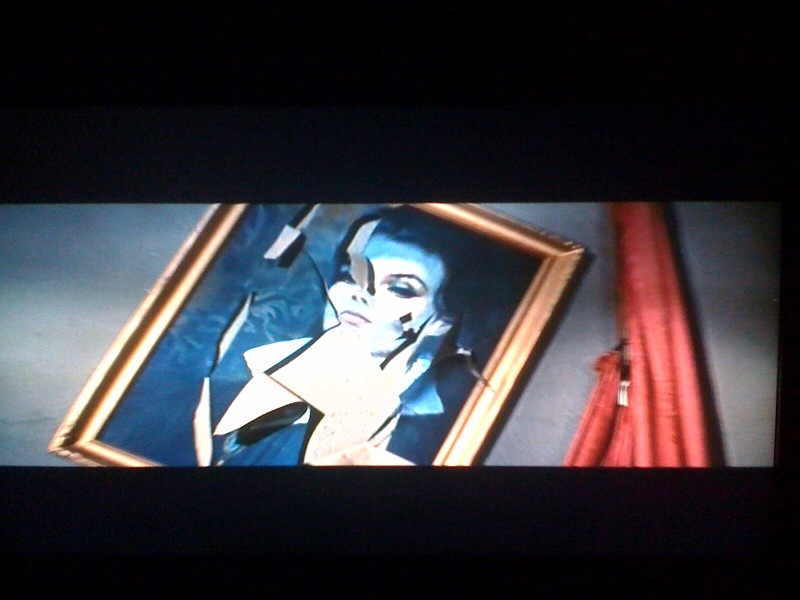 Here, as her bloodied hand appears from her stone casket, Steele gets an amazing entrance. Rising, she is kept in shadow as she stalks the fracturing Price through the halls . Only when he collapses on the dungeon floor, his mind broken, do we see her appear from the shadows. A beautiful “corpse” hovering demonically over her shattered husband . As the the doctor enters revealing the adulterous affair between them Steele is a joy to watch as she revels in torturing Nicolas, who stares vacantly, and talks of how she waited “a eternity for this” invoking the spirit of Nicolas’s dead mother and perhaps other victims of the dungeon as well. Nicholas’ mind now gone, in turn becomes inhabited by the spirit of his father Sebastian who sees not Elizabeth but Price’s mother, and begins to exact his revenge on the adulterous couple! The music of Les Baxter during this whole sequence is remarkable as well. Baxter doesn’t’ go heavy on anticipating or heightening moments, playing the viewer easily, but instead the music seems to hover underneath reinforcing the dread, eventually breaking apart as well, in stabs, bursts and echoes, musical bats flying out of the darkness.